U.S. Secretary of State urges Europe to cut off funding to Hizbullah after Bulgaria blames the terror group for the Burgas bus bombing. 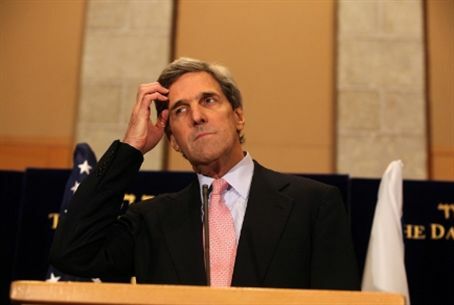 U.S. Secretary of State John Kerry on Tuesday urged Europe to cut off funding to the Hizbullah terror group, after Bulgaria blamed Hizbullah for an attack that killed five Israeli tourists in July. "We strongly urge other governments around the world -- and particularly our partners in Europe -- to take immediate action to crack down on Hizbullah," Kerry said, according to AFP. Washington has been actively pushing the European Union to also take steps to ban Hizbullah as a terrorist organization. In December the Senate passed a resolution calling on European countries to designate Hizbullah as a terrorist organization. Kerry, who discussed the issue during talks Tuesday with EU foreign policy chief Catherine Ashton, said the Bulgarian finding was "clear and unequivocal: Lebanese Hizbullah was responsible for this deadly assault on European soil." The bus bombing, in which five Israeli tourists and their Bulgarian driver were killed at Burgas airport last July, was part of "a stepped-up terrorist campaign by Hizbullah... around the world over the past year," State Department spokeswoman Victoria Nuland warned. "Our concern has been that Europe has been one of the places that they have exploited," said Nuland. President Barack Obama's top counter-terrorism adviser John Brennan, his nominee to lead the CIA, also called on European states to take "proactive action" to uncover Hizbullah’s infrastructure, financing and networks. "We call on our European partners as well as other members of the international community to take proactive action to uncover Hezbollah's infrastructure and disrupt the group's financing schemes and operational networks in order to prevent future attacks," Brennan said. Prime Minister Binyamin Netanyahu released a statement Tuesday, after Bulgaria officially blamed Hizbullah for the Burgas attack, in which he called on the international community to recognize Hizbullah as a terrorist organization. “The implications of the investigation need to be assessed seriously as they relate to a terrorist attack on EU soil, which resulted in the killing and injury of innocent civilians,” she said.